Stephen Estey is a founding partner of Estey & Bomberger, LLP where he specializes in cases other attorneys see as “unwinnable.” Steve is a compassionate person who understands the trauma his clients have suffered and works tirelessly to provide them the justice they deserve. 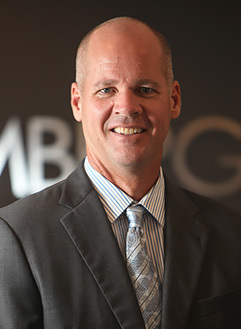 He co-founded Estey & Bomberger with partner and law school friend Mike Bomberger, and they have collaboratively grown the San Diego personal injury firm from its 1994 inception into one of the most formidable trial firms in California. Stephen is one of only 10 Board Certified Trial Attorneys in San Diego. He is a two-time recipient of the coveted, “Trial Attorney of the Year” award from the Consumer Attorneys of San Diego (CASD). He has also received four Outstanding Trial Lawyer Awards from CASD. His AV Preeminent rating is based upon his top-notch trial skills and multiple record setting verdicts (many in the eight figure range). Since 2010, Stephen Estey has been included in The National Trial Lawyer’s list of Top 100 Trial Lawyers. In addition, since 2011 he has been listed amongst ”The Best Lawyers in America”. Steve was named Super Lawyer for the years 2008-2014. He was also chosen as a finalist for the Consumer Attorneys of California’s 2010-2011 Consumer Attorney of the Year Award. Stephen Estey values education and teaches trial skills to other attorneys at various seminars throughout the United States. Steve is also a popular presenter and guest speaker and has presented to the community at various conferences including the Color of Child Welfare Conference in Milwaukee, the National Center for Victims of Crime, the East Los Angeles Women’s Center, and the San Diego International Conference on Child and Family Maltreatment. Steve is the expert on issues involving child sexual molestation in institutions. Some of his more notable interviews are linked below; for a full list click here. Stephen Estey has years of experience and client success with the following practice area specialities: Childhood sexual abuse, Catastrophic Personal Injury, Automobile Accidents and Injuries, Slip and Fall, Products Liability, Construction Accidents, Product Defects, Brain Injury, Truck Accidents, Motorcycle Accidents, Bicycle Accidents, Airplane Crash Litigation, Elder Law, Nursing Home Abuse and Neglect, Insurance Bad Faith, Birth Injuries, Wrongful Death and many more.